So after being so impressed with my little DRZ400s that I just took on a 2,000+ mile trip last month from Chicago to North Carolina and back, ( read here if you want: Our wild ride ) what's the next logical thing in the world of Warner? Yep...to sell it. Haha. But here's why. I NEVER ride off road, which is a big advantage this bike had over a traditional street bike. And....way back in the day when I was doing competitive speedskating (mid 90's) one of the guys on my team, who was a good 25 years older than me, had this killer Honda motorcycle in his garage. I used to see it when I'd go to his house to drive to an out of state race together. I'd always rib him about it and when he was going to give it to me. We'd laugh and joke, but nothing serious. A couple of years ago, after a 20 year gap, I started back up with speedskating (not competitively) and I ran into my friend Herman at one of the practices...and just for kicks, I ribbed him about the bike again. I was shocked to hear that it was still around...and not really doing much. I didn't really pursue it with much vigor, but it always was in the back of my mind. So after this trip, I started thinking about it again....being the OCD person that I am. I texted my friend Tom who had the list of contacts for the team, and he told me that nobody had hear from Herman for a couple of years, but gave me the last contact info that he had for him. So I sent a text to the number that my friend Tom gave me, and low and behold, Herman responded. So my 2nd text to him was "Where's my bike?". Hahaha. Again, surprised to hear that it was still around....and was owned by his son, who's around my age. Herman put me in touch with his son, who had been thinking about selling it. I talked to his son for about an hour one day about it. He was the owner since day 1. He bought it new in 1992, it's a 1990 model. He watched the dealer uncrate it and put it together. He always had the bike serviced by the dealer, and did any maintenance/replacement of parts that they suggested. He replaced the tires 2 years ago, and other parts as needed. It only has 7,000 original miles on it! These bikes are known to go over 100k miles. So to me, it's an older model, but LOTS of life left in it. Back in 1991, I owned and drag raced a GSX-R1100 that was similar to this bike. A little harder edged....slightly quicker and faster, but in the same ballpark as this bike. I remember how much I loved that bike....even to the point of having occasional dreams about it many years later. I'd dream that I somehow still lived with my parents (I know, right?) and that the bike was in their garage, kind of hidden behind some other stuff. Really strange. But I remember feeling excited that I still HAD it. Then I woke up. Haha. Anyway, I asked John (Herman's son) what he thought was a fair price for the bike. We went back and forth just a little bit, and agreed on a fair price. I told him that I'd try to sell my existing bike (the DRZ) and see how much I could get for it. I'm sure he was thinking that I'd never sell it, or not for anything close to what I needed to buy his. It was in my head that I really wanted to make it an even trade. 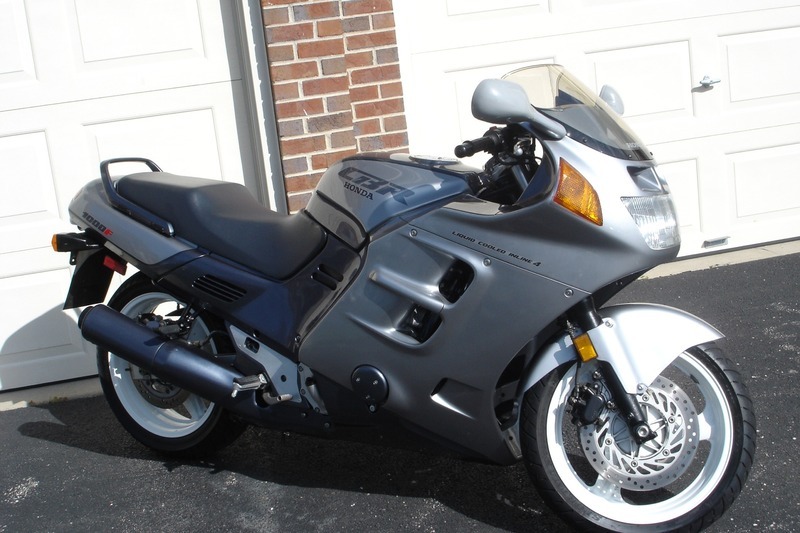 So I put my bike on Craigslist, asking $500 more than I needed to get to buy the CBR1000. Two days later, I had a guy come out and look at it, ride it, and tell me he wanted it. For the exact same amount that I'm buying the CBR for. I love it when a plan comes together! The guy picked up the DRZ yesterday. John misplaced the title for the CBR, so he's put in a request to the Secretary of State for a duplicate title. That process has really sped up and should only take a couple of weeks based on my recent experience with that. 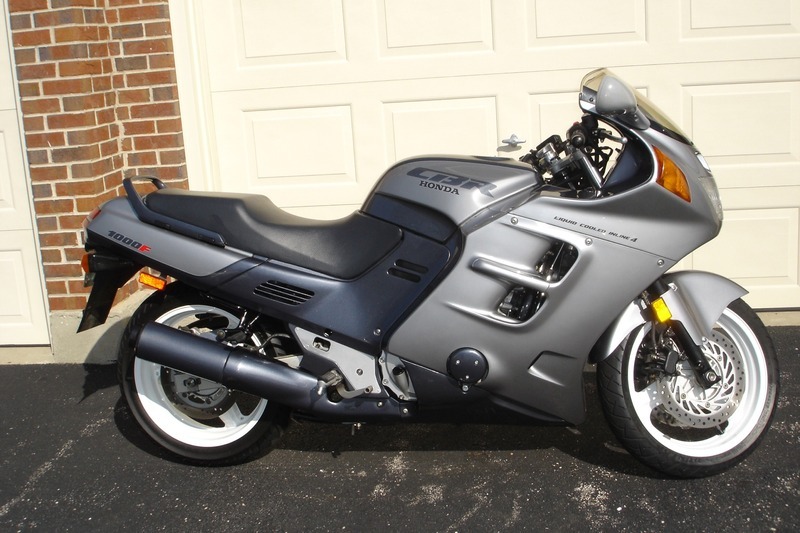 Anyway, without further ado, here are some picture of the bike I'm getting. These were not taken 24 years ago when the bike was new.....if you look at the odometer in the photos it shows over 6,800 miles on it. The bike has 7,011 now. What a gem! Let me know what you guys think and if there's anything I should be cautious or aware of. Really kept in good shape and low miles, mine is a bit beat up. I'm impressed. Nice find, it sounds like the bike was meant for you. Very low mileage models are getting hard to find and yes you should get over 100000 miles out of it and then some if you take good care of it. Not much to look out for, the bike is pretty bullet proof. Thanks much! I can't tell you how psyched I am to ride it for the first time. 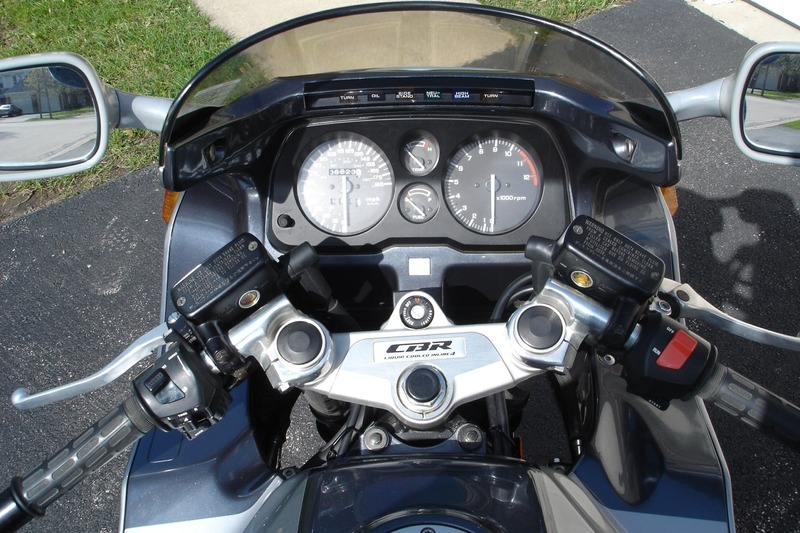 I remember back in 1991 with the GSX-R1100.....riding it was like a drug, and I was addicted. I'm 25 years older now....or twice as old....was 25 then and I'm 50 now. The story behind this bike is interesting too.....never would I have believed that the bike was still around, let alone with only 7k miles on it. what's the next logical thing in the world of Warner? Yep...to sell it. Haha. But here's why. I NEVER ride off road, which is a big advantage this bike had over a traditional street bike. Its not like it use to be, that's why I sold mine. I do miss it but there's only about 2 places to take it off road without landing in jail these days (I'm in upstate NY). Nice looking CBR, better power, comfort and range. I have 73,000 plus miles. Bought it with 52k for $800.00. Mine's a little down at the heels but she never fails to please.